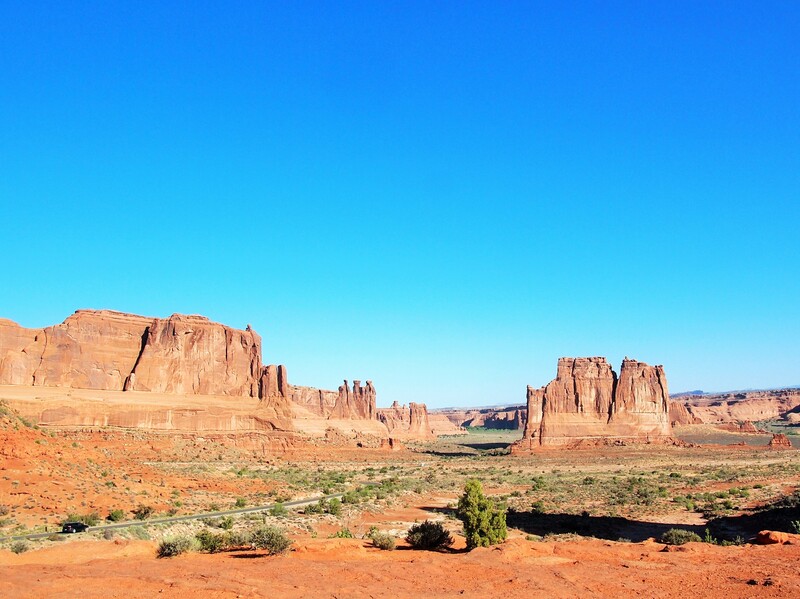 When we first visited Arches NP in November 2015, we were driving through Moab on our way to Salt Lake City, and we spent only a couple hours in the park. 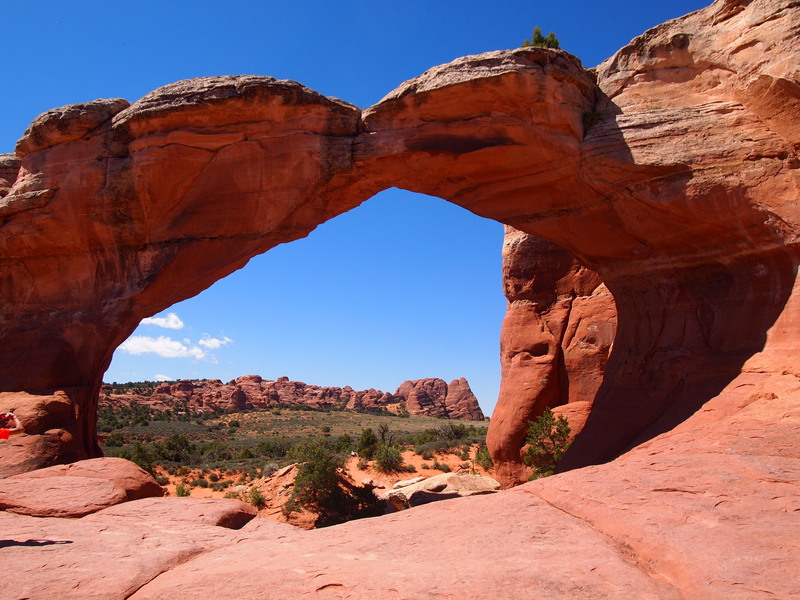 Last November, when we visited again, we were only able to do two hikes – Landscape & Delicate Arches. 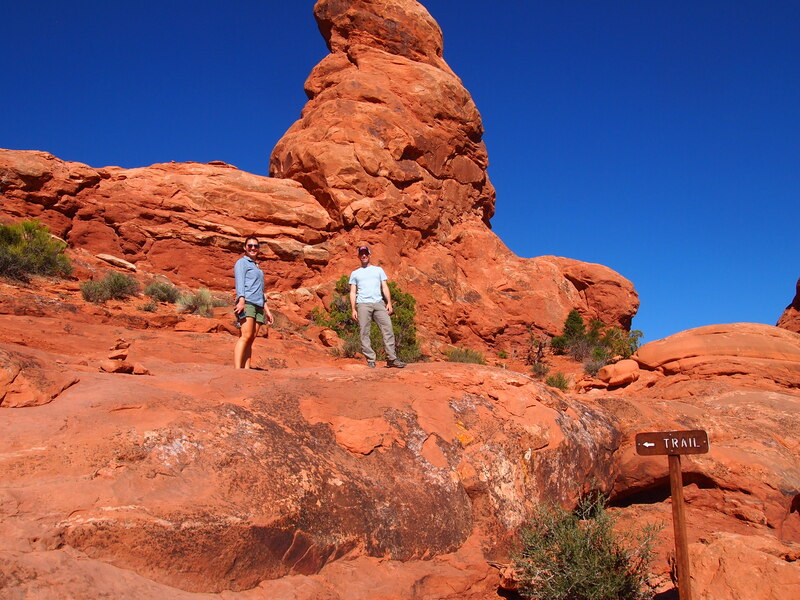 So when our friend, Pam, decided to come visit us and wanted to see a bit of southern Utah, we thought a proper trip to Moab was in order. 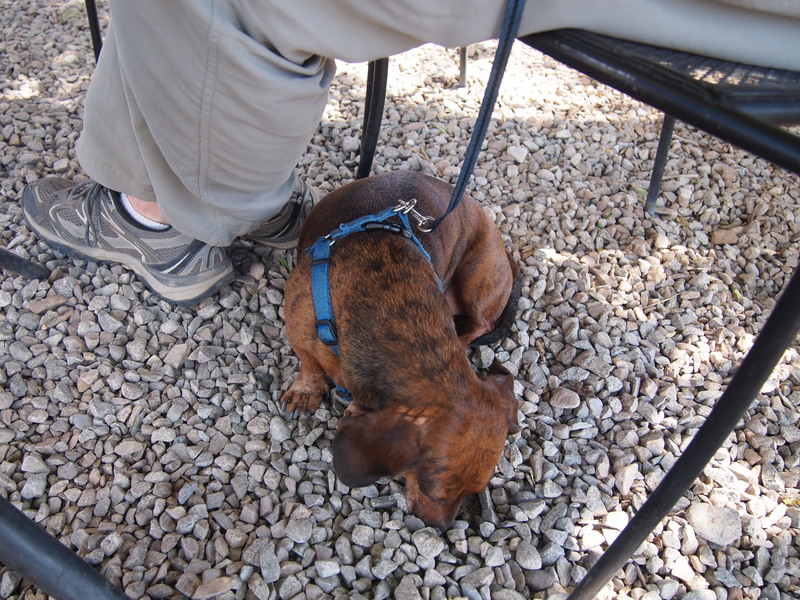 In November we stayed at Kokopelli Lodge, a pet-friendly establishment just a block from Main Street, so we decided to do the same and bring Truman with us. 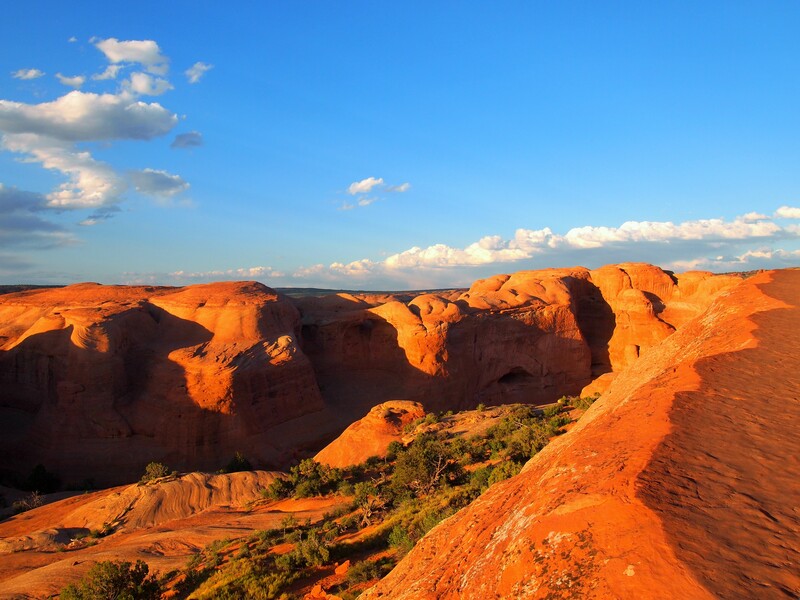 Although dogs aren’t allowed on any of the trails in the National Parks, there are various other trails around Moab, including a state park which allows leashed dogs on its trails. 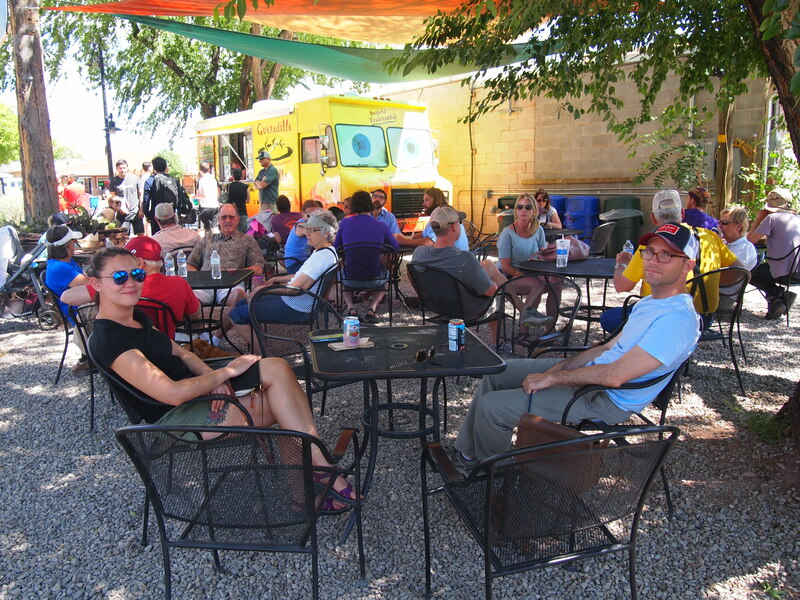 We left Salt Lake around 4pm and arrived in Moab just slightly after 8pm – traffic out of Salt Lake slowed us down a bit. 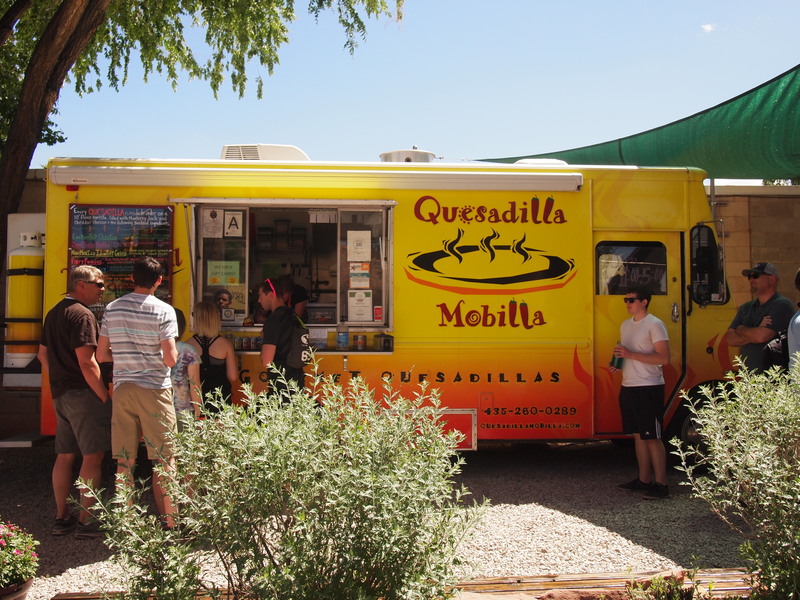 It was great to get in on Friday night, have dinner and some beers, and get an early start the next morning. 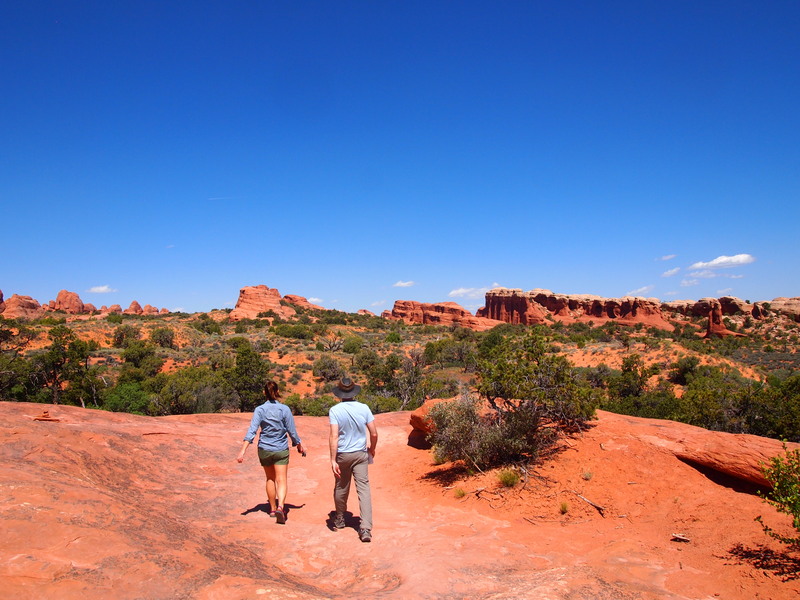 Due to road construction in the park, the Devil’s Garden area was closed for our visit – a true disappointment because I was hoping to hike there – but thankfully everything else was open. 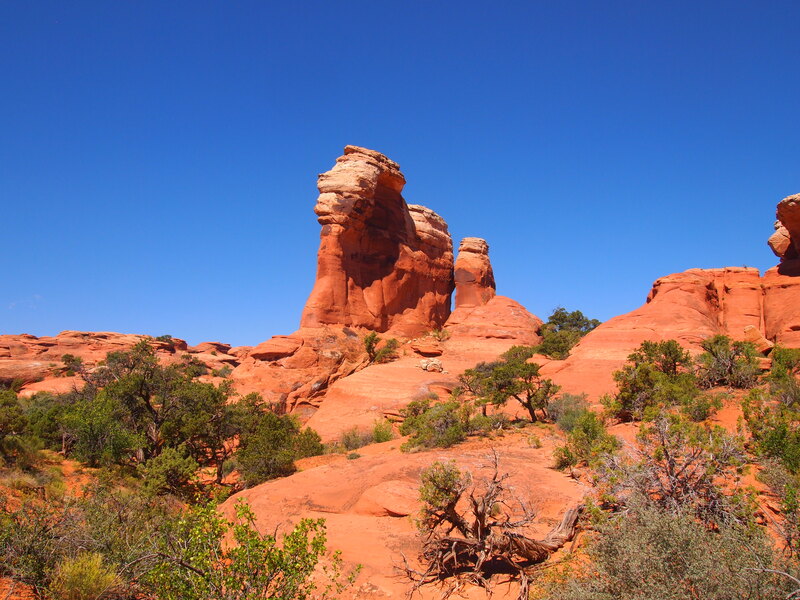 We started our day with Balanced Rock taking the short primitive loop around the rock for some cool perspectives and moved on to The Windows. 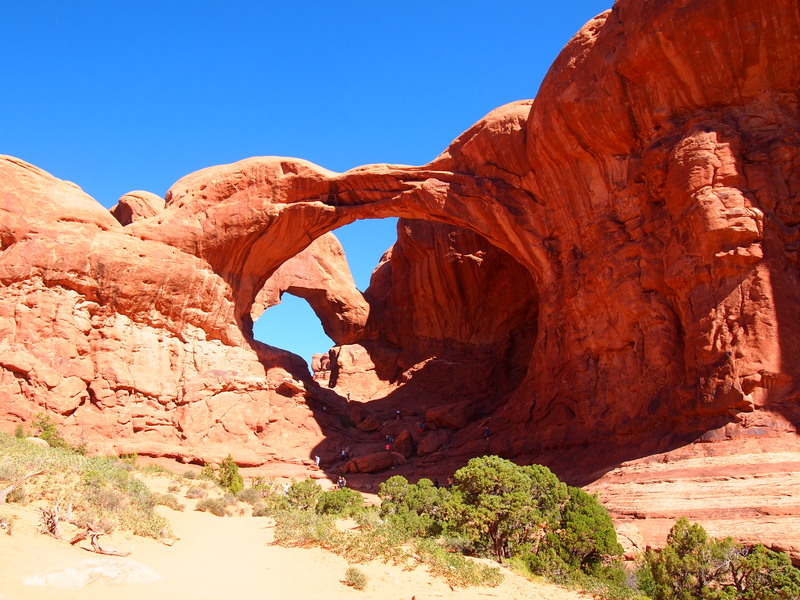 On our first trip to Arches we did the incredibly brief trail to the North Window and Turret Arch before turning around. 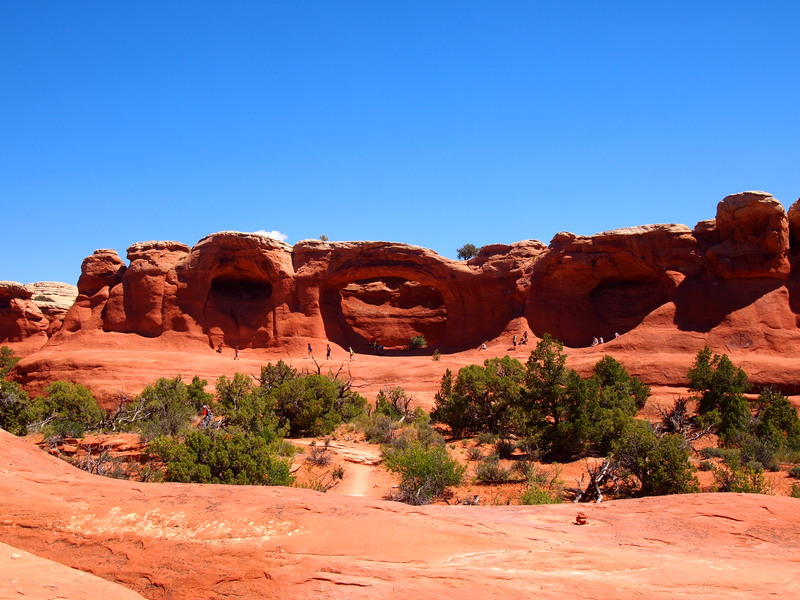 This time we took advantage of the primitive trail which loops behind both Windows. Wow. 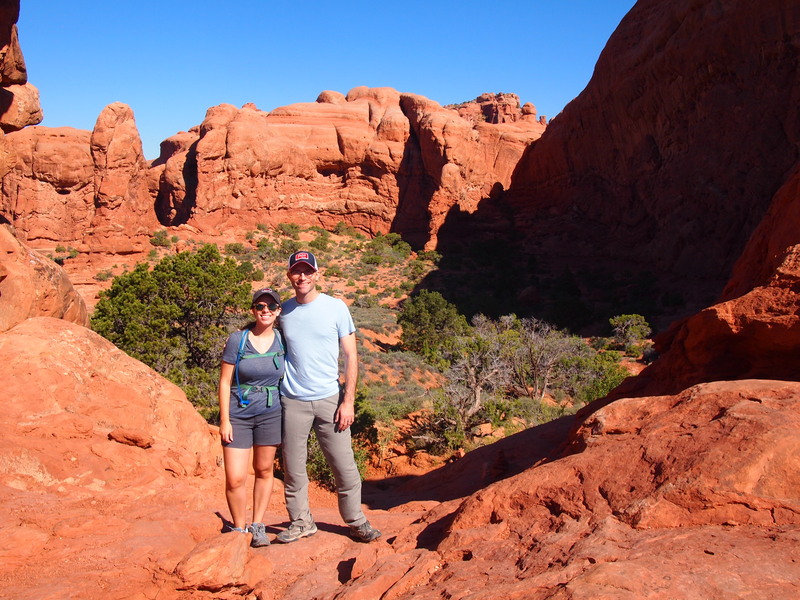 Even though we had seen the Windows and Turret Arch before, the primitive trail gave us a much better perspective and, as an added bonus, there weren’t any other hikers around. 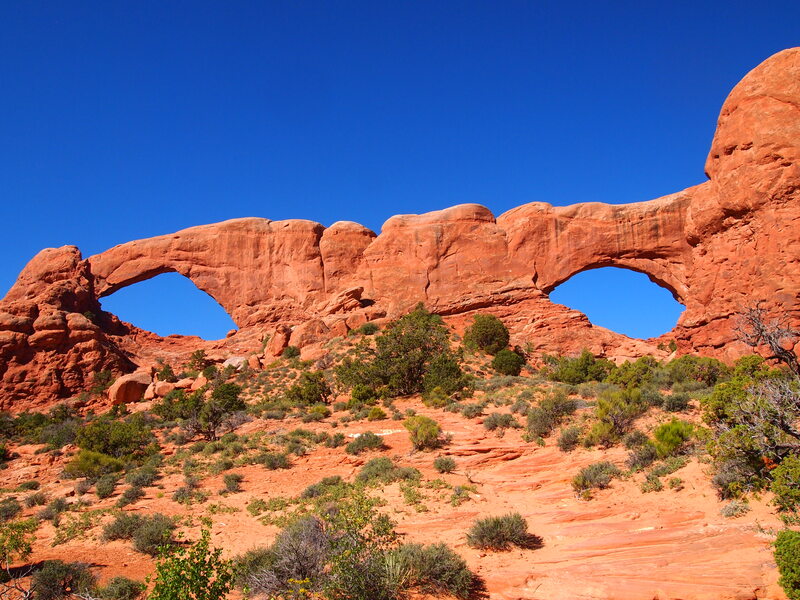 It was the perfect time of day for the primitive loop too; as the sun rose in the sky, it shone brightly on the eastern face of The Windows and Turret Arch. After we looped back around to the parking area, there were a couple more tour buses which had dropped off loads of people. 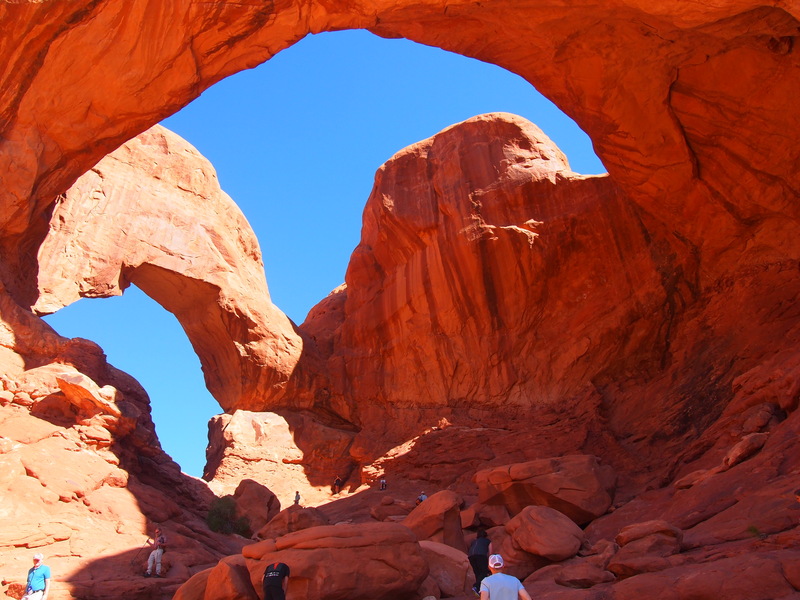 Grateful to have missed the crowds, we went across the lot to Double Arch. 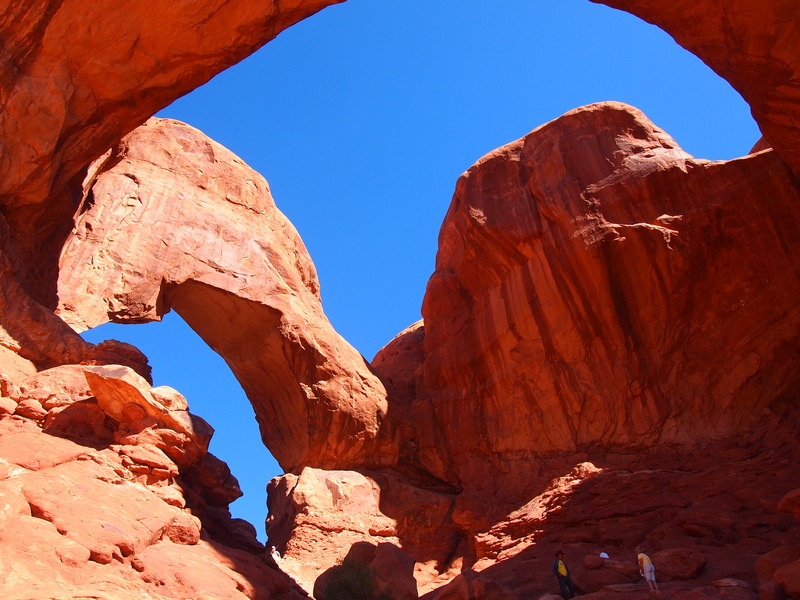 Double Arch, an impressively large combination of two arches, is well worth the short trek. 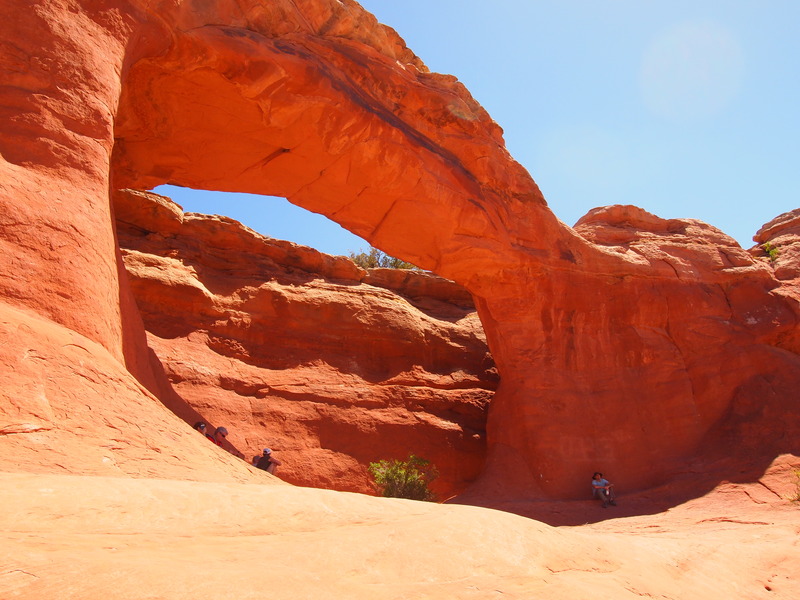 Double Arch may look familiar to fans of Indiana Jones and the Last Crusade; it was featured at the beginning of the film. 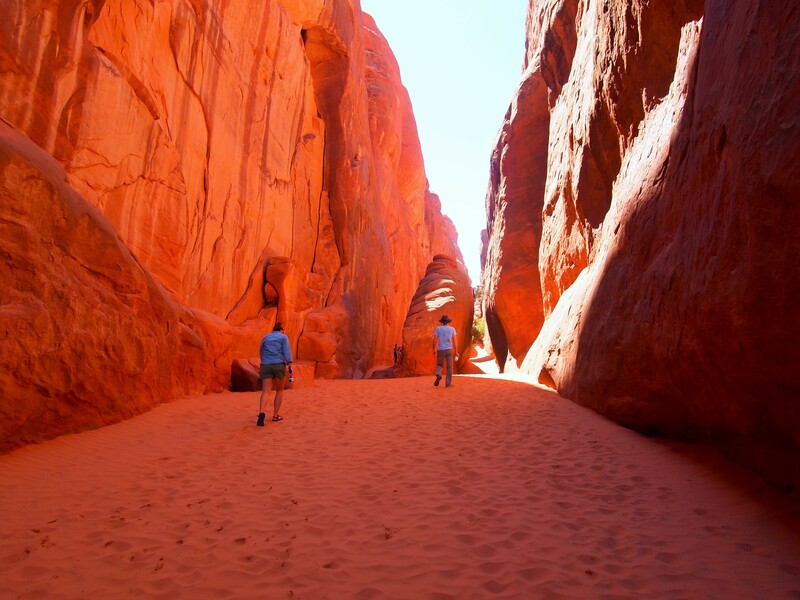 Though the trail to Double Arch is easy, getting into the center of the arches requires a little climbing and scrambling. 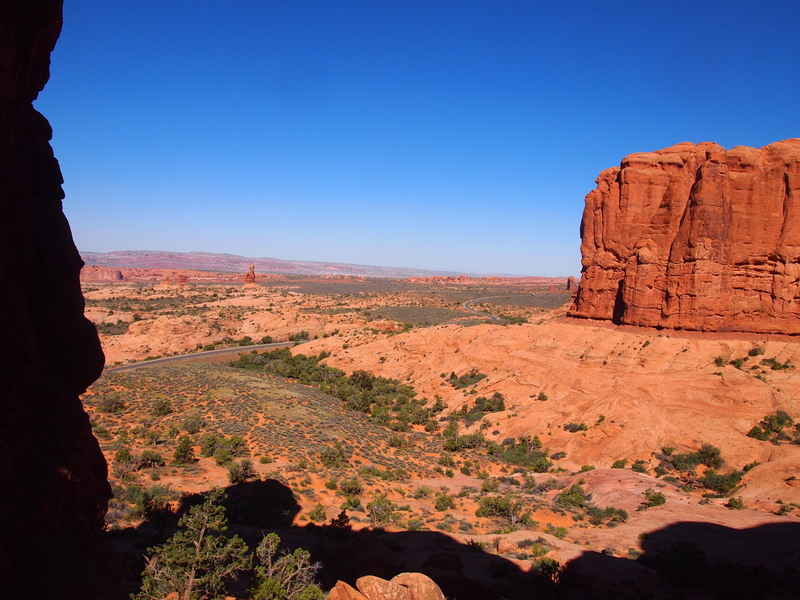 We left Double Arch with one more hike in mind for the morning. 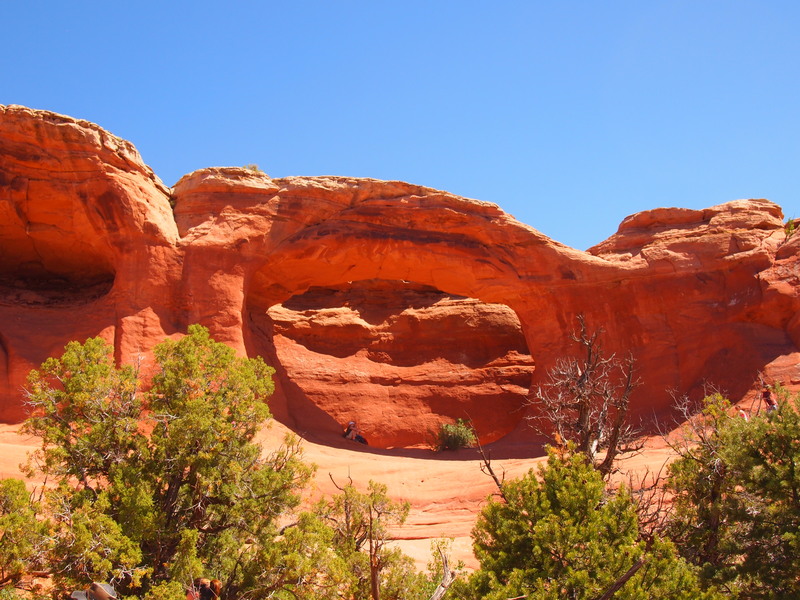 Since Devil’s Garden was closed, the park road stopped at the trailhead for Sand Dune Arch, a short 0.3 mile hike that can be combined with Broken Arch to make a larger 2 mile loop. 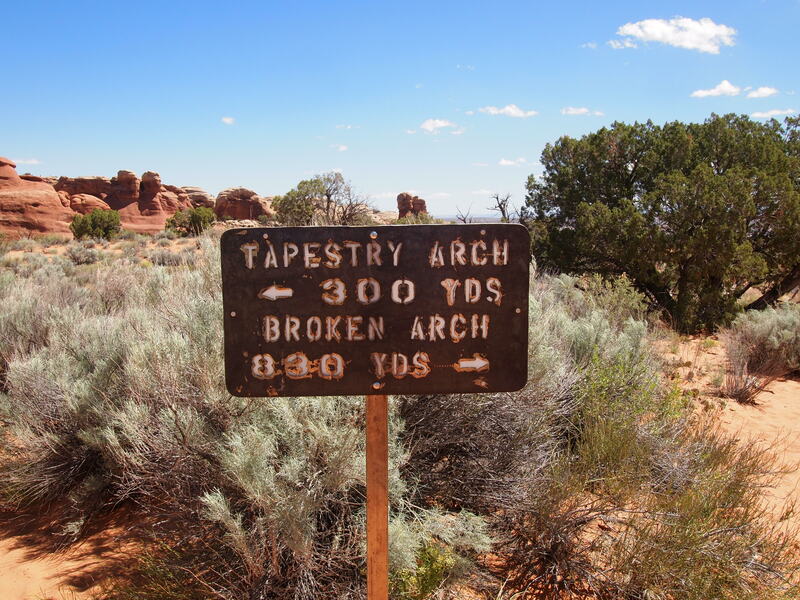 Although part of the loop was closed due to the construction, we were still able to hike to Broken Arch and farther on to Tapestry Arch; we just had to double back the same way we came in. 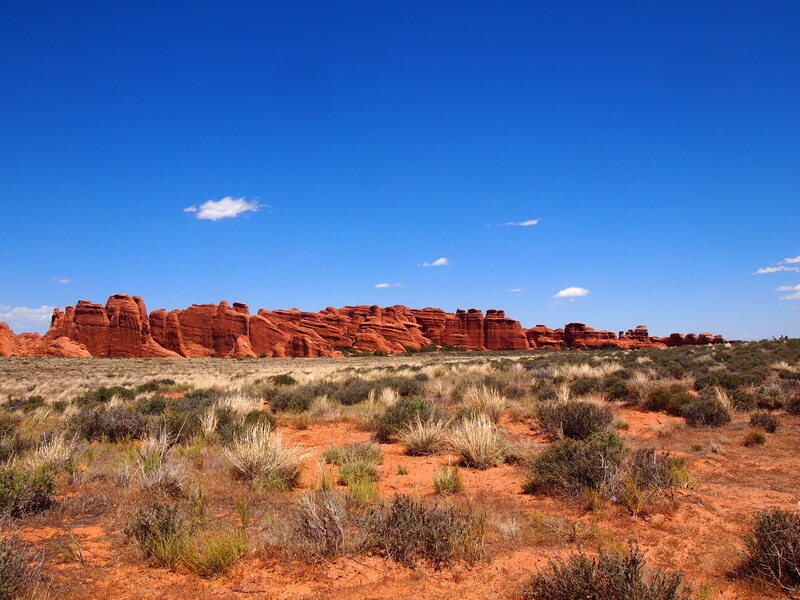 Though it wasn’t awful in the rest of the park, the gusty winds that day were especially tortuous during the short hike to Sand Dune Arch. 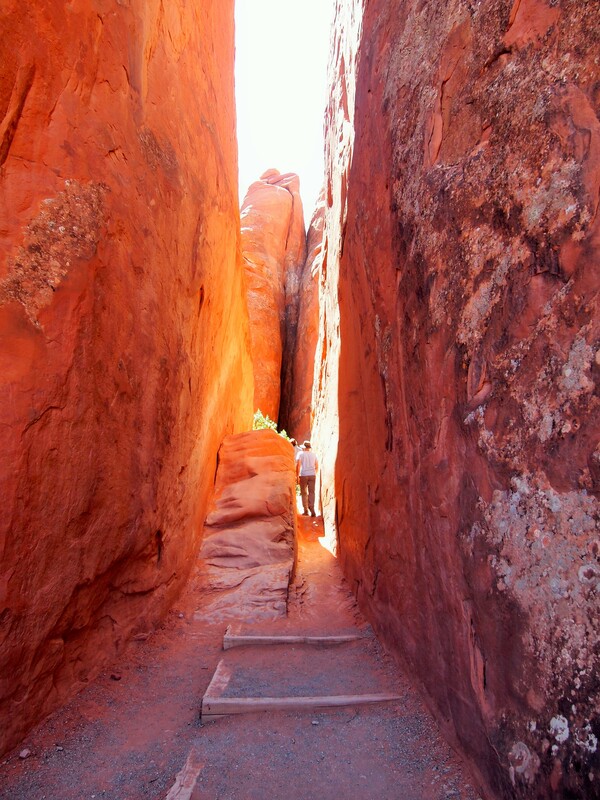 Past a narrow opening in the rocks, the trail becomes a blanket of soft sand. With each gust, sand was whipped up into our faces and thrown on the backs of our legs. 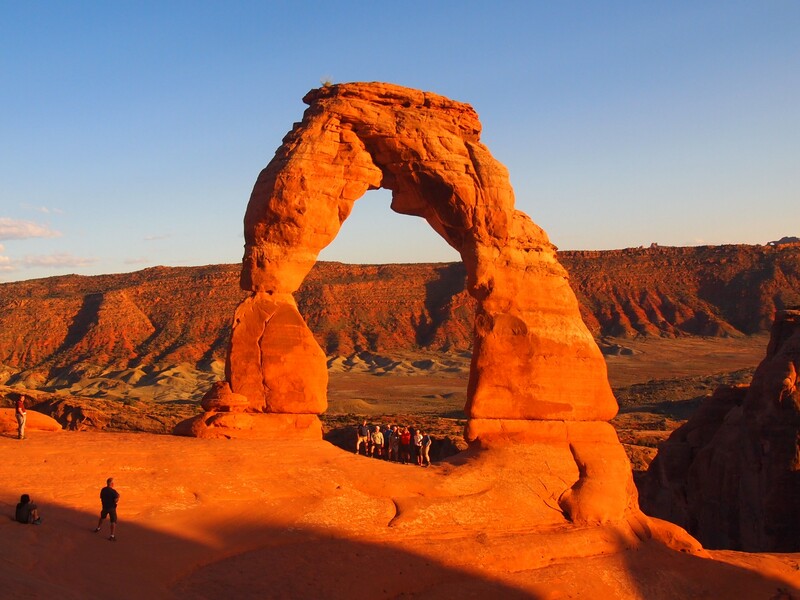 Due to recent rock falls, a sign encouraged hikers to keep a safe distance from the arch so we decided not to stand too close. 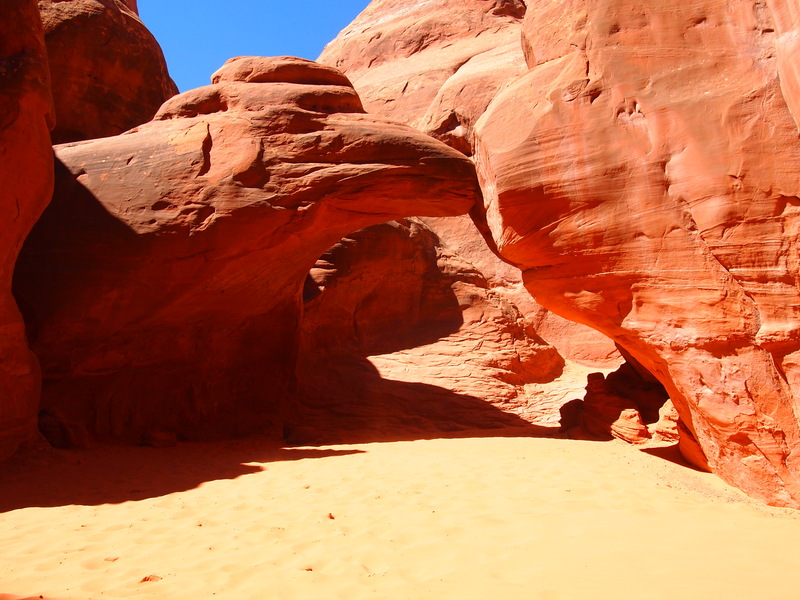 We left the sand trap to begin the longer hike to Broken and Tapestry Arches. 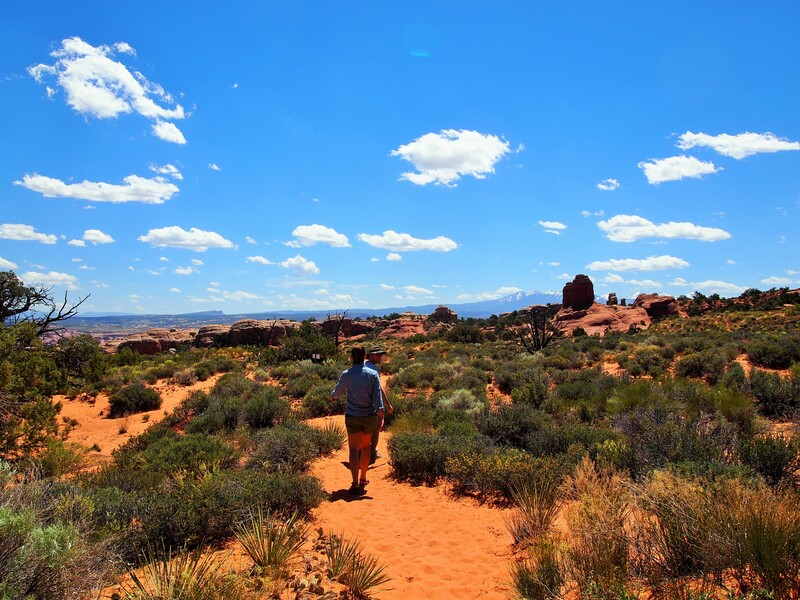 The first part of the hike led us across an open meadow of sage brush to Broken Arch. 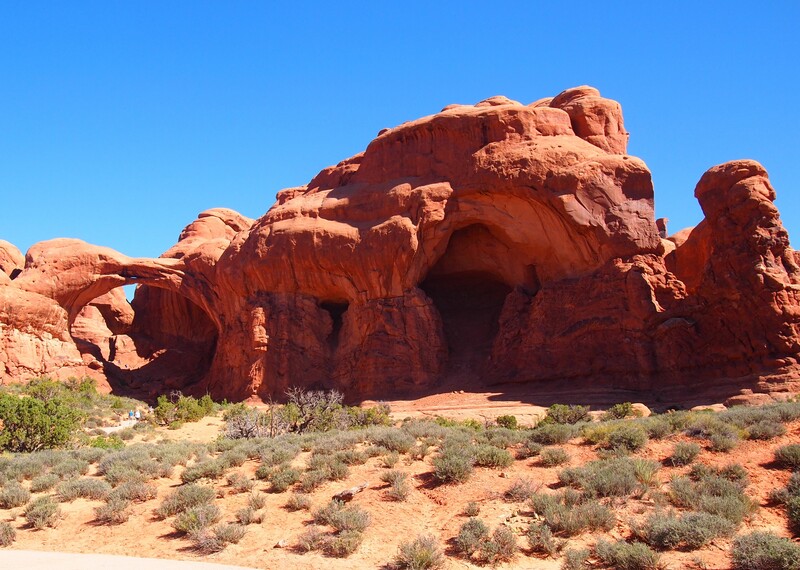 We had to climb through the arch to continue on the trail. 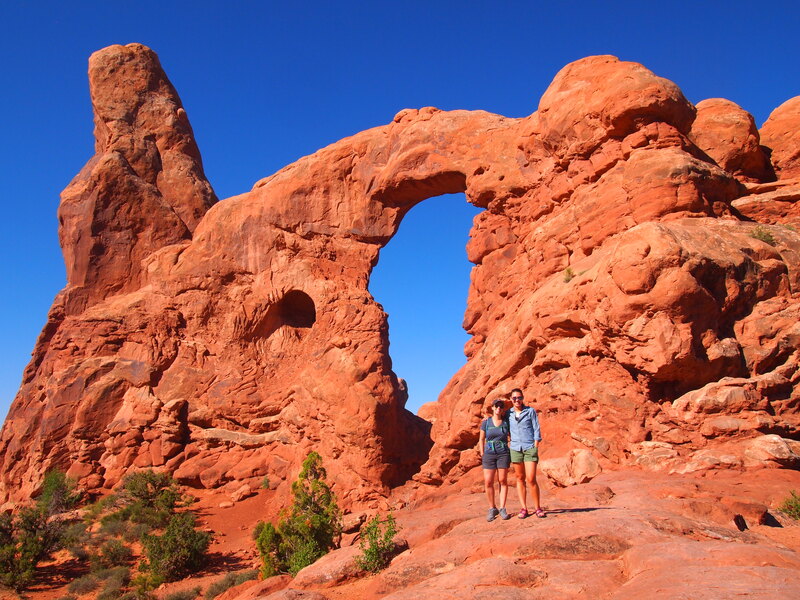 I thought the view of the arch was actually better from the back and for a brief moment we had it to ourselves. 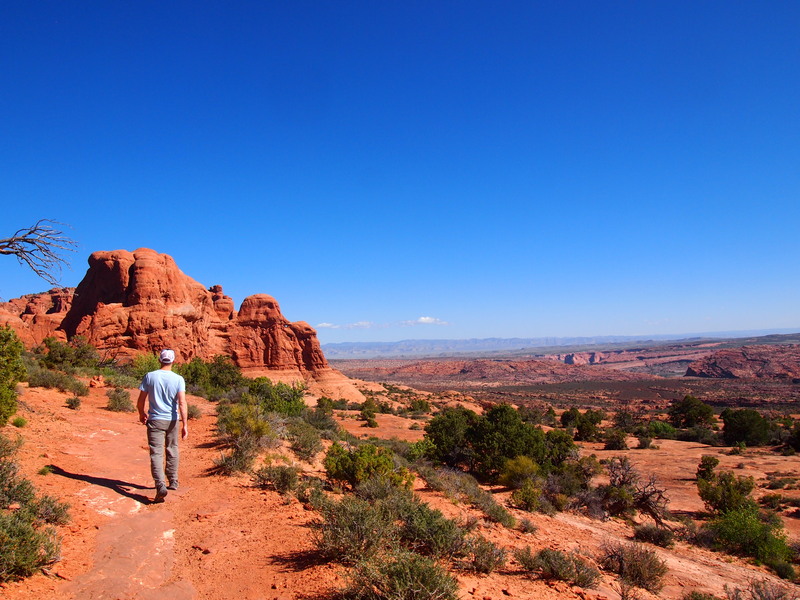 We continued through more open meadow, coming upon slickrock every once in a while, until the trail turned toward Tapestry Arch when it became all slickrock – though we didn’t have to do much scrambling to reach the arch. We were grateful for the wind at this point, as the sun had reached its zenith and blazed down on us for the duration of the hike. 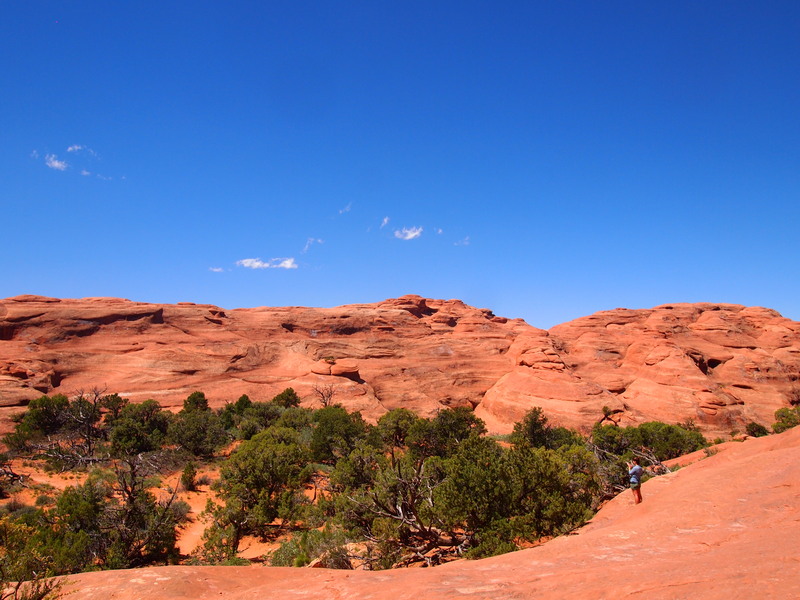 All in all, it was a great little hike and a good substitute for Devil’s Garden. 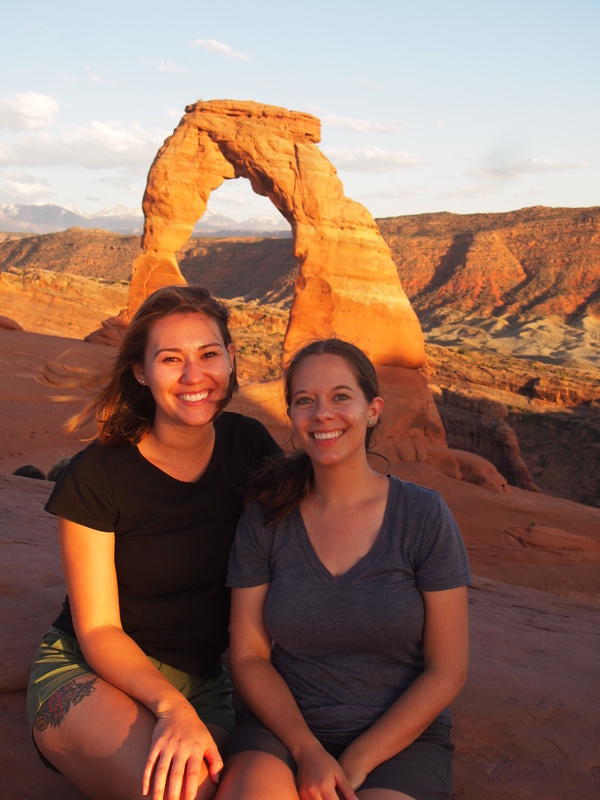 We were fairly tired by this point – and hungry – so we decided to go back into town to rest and eat before coming back to do Delicate Arch just before sunset.